Simmy was an unaccounted-for variable — an anomaly. 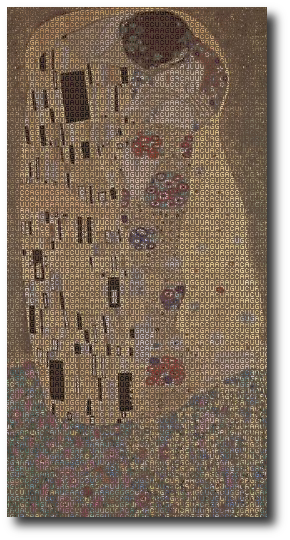 Artwork : The painting The Kiss by Gustav Klimt, overlaid with the human genetic code. 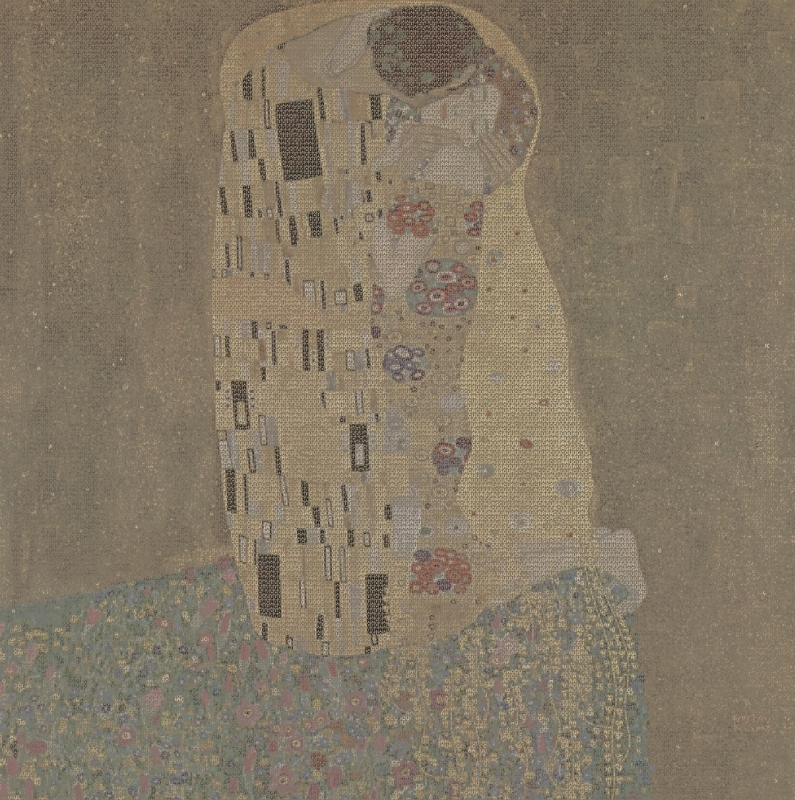 The original painting is in the public domain; the typeface is the free bitmap font Arma Five. These versions (above and the larger version you reach by clicking on the image) are hereby released using the Creative Commons Attribution ShareAlike License. My predisposition for science began as a boy; then, grasshoppers were my fascination. I caught them by dozens, built wire mesh homes, and gathered a variety of vegetation, crabgrass, clover, dandelion weeds — so they’d stay happy and entertain me. Occasionally one perched on a twig and peered out, as though knowing the cage wasn’t its indigenous habitat, cautionary, waiting for predators. It was also the one that would inevitably skitter and flail, find its way out, hop its way toward freedom or away from captivity. I was never sure which. This morning I found her sitting cross-legged by the dryer, face buried in a basket of linens. “They smell nice,” and she offered me a dishtowel; it was warm, smelled of talc. She smiled in contrast to her glassy eyes. I try not to delve too deeply, as I believe that old saying — some things are better left unsaid. I met her seven months ago; she was bitten by a cottonmouth while building a campfire, drove herself twenty miles to the nearest gas station to call for an ambulance. “Why aren’t you staying at KOA?,” I asked, after I’d administered antivenin and was dressing the bite. Her long raven hair was braided that day, lending credibility to her sultry, mysterious answer, “I don’t trust people who camp for fun.” She swatted at something in front of her face that only she could see. “But you’re camping.” I held her swishing hand in mid-air. “It’s where I live, not for fun.” She pulled her hand from my grasp, tilted her head and continued to bat at whatever it was bothering her. Within days she was a permanent squatter in my home and even though the snake had bitten her, I was the one affected; my social life altered dramatically. Nurses, in jealous admiration, ribbed me about the young gypsy princess who’d hypnotized me. Until that time, I attributed my fascination with women to pseudo-scientific exploration, an innate discovery process. I collected data with systematic vigor. But Simmy was an unaccounted-for variable — an anomaly. An element of intrigue drew me to her, one I could not define — that, plus the fact that she had tremendous physical assets. She nullified my objectivity, yet heightened my need for discovery. The only constant now is that she gets scared in non-linear patterns, and her fears are best treated with silent acceptance. I suppose, for her, it’s like having a broken bone that aches with changes in barometric pressure. But unlike a meteorologist, I don’t have a reliable instrument with which to gauge severity or direction; her variations simply can’t be predicted. For example, last week she dropped an ice cube. It fell to the floor and she became frantic, mumbling apologies. With each approach of her warm fingers, it continued to flee. Her cries mounted as I retrieved it and she sat on the tile, pressed against the refrigerator, head in her hands, high-pitched sounds wavering like distant warning sirens. I knelt, touched her shaking shoulder and she looked up, piercing me with those gem-green eyes. She clutched my face, yanked me to the ground and hugged my neck; what started as unrestrained panic had evolved into uncontrolled laughter. “Strange.” — that’s what she said this morning, and that much is fact. I flipped the basket upside-down, spilling the towels, sheets, and socks over her head. She undid my scrubs’ drawstring and pulled them down, pulled me down. Her kisses were aquatic, brine-flavored, and her clutch tight like a vise. Our heat intensified the smell of fabric softener as we tousled in the linens, exploring our strangeness. Simmy bit my ear. “You know I like you,” she whispered. There is something said to cast out fear and at this point, I have no alternative but to keep the door open and test this new hypothesis. Could be, we’re creating empirical evidence. Shelly Rae Rich likes to make things up and mix them with truth. Her fiction is found in print and online publications including Apalachee Review, Duck and Herring’s Pocket Field Guide, Opium Magazine, Titular, Locus Novus, LITnIMAGE, Tulip, and Moon Drenched Fables, and has been translated into two languages. She currently works on that elusive novel-in-progress and her screenplay. More can be found at http://blog.shellyraerich.com. Copyright © 2009, Shelly Rae Rich. All Rights Reserved.